Really new news you get only on the "german" version of this homepage. Sorry for that! Behind the gallery "Schacher - Raum für Kunst" is only one person. The Galerienhaus Stuttgart is complete again! Andreas Kerstan has joined the crew at beginning of the year 2016. The exhibition "Body and Soul" for the rooms of Stuttgart based Sympra GmbH was extended till 19.2.2016. In their homebase in Stafflenbergstr. 32, Stuttgart, you could see works of Tesfaye Urgessa, Birgit Feil, Christiane Köhne and Axel Teichmann. Interested in an interview with Mark Thompson? Then visit the homepage of the "Fluster"-magazine (text in english and italian) >> Here. The next Thompson exhibition at "Schacher" will be in November 2016. The exhibition "Yi Zheng Lin, Claudia Thorban - Flower Power" combined mixed media works of Claudia Thorban with poetic objects of Yi Zheng Lin (photo) made out of trivial plastic stuff. The exhibition "Open Source" combined paintings of Kirsten Lampert (Düsseldorf) with works of Christiane Köhne (Böblingen/Stuttgart). In the "Projektraum" you could see works on paper from Ute Litzkow (Berlin). 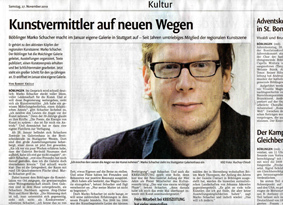 The exhibition "Humor muss nicht immer lustig sein" (humor don´t have to be funny everytime) in the Galerienhaus showed – as cooperation with the Stuttgart Academy of Arts – positions with the topic "humor". The exhibition at "Schacher" combined miniature paintings, works on paper and sculptures from Eva Koberstein, Justyna Koeke and Oliver Wetterauer. The exhibition "Uli Gsell, Marc Dittrich – Bau Werk" was/is in vogue – as the artists of the gallery programme are. Several "Schacher"-artists had and have exhibitions all over the world. There is a new Uli Gsell catalogue published (58 pages, texts by M. Schacher, U. Zubal, P. von Olschowski) which you can buy for 10 € in the galler. Uli Gsell showed in the gallery "Op der Kap" in Capellen in the southwest of Luxembourg his sculptures which are changing between accident and accuracy. 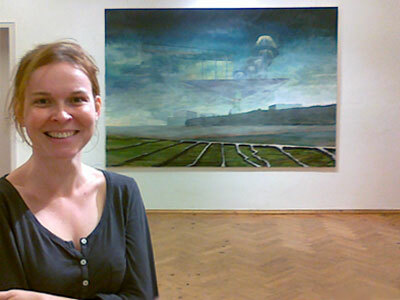 Also very rewarding was the way to Sulzfeld and to the exhibition "Johanna Jakowlev – Weitblick und Hindernisse" in the "Bürgerhaus" (the photo above shows the artist in front of her painting "Wird längst vergessen sein II") with landscape paintings of the last five years. More: www.kulturkreis-sulzfeld.de. Since 10th November 2011 you can visit the exhibition "Release und Kunst" in the foyer of the EnBW company (Kriegsbergstr. 32, Stuttgart). In the show you can see miniature paintings of Oliver Wetterauer and photographs of Klaudia Dietewich. Weitere Infos: www.release-drogenberatung.de. On 27th May the Galerienhaus Stuttgart had invited to a "Finissage". 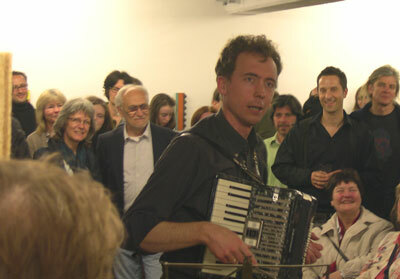 The visitors could watch videoclips from and with Udo Schöbel, who commented his films in a very cranky way. In the "Projekt-Raum" was an installation of Jim Avignon. 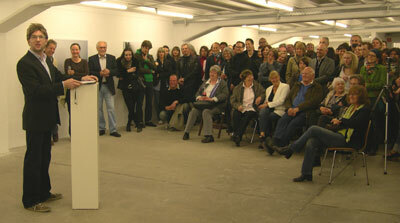 On 29th April the exhibition "Udo Schöbel, François Chalet - Seitenwechsel" was opened. For both artist this was their first exhibition in a private gallery. Some of the portraited VIPs were present (see picture on the left). 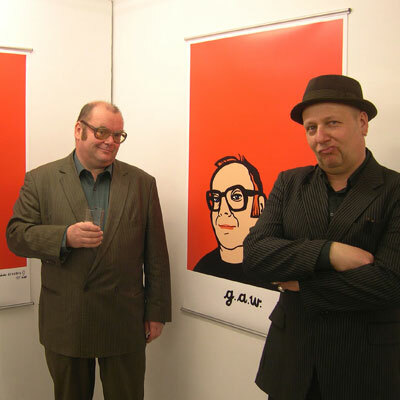 On 15th April Hartmut Landauer and Timo Brunke invited to their "Impro-Poetry-Slam". About 200 visitors came - even a professional like Timo Brunke got stage fright! Mark Thompson has finished for the Finissage three new works on paper with scenes from Stuttgart. 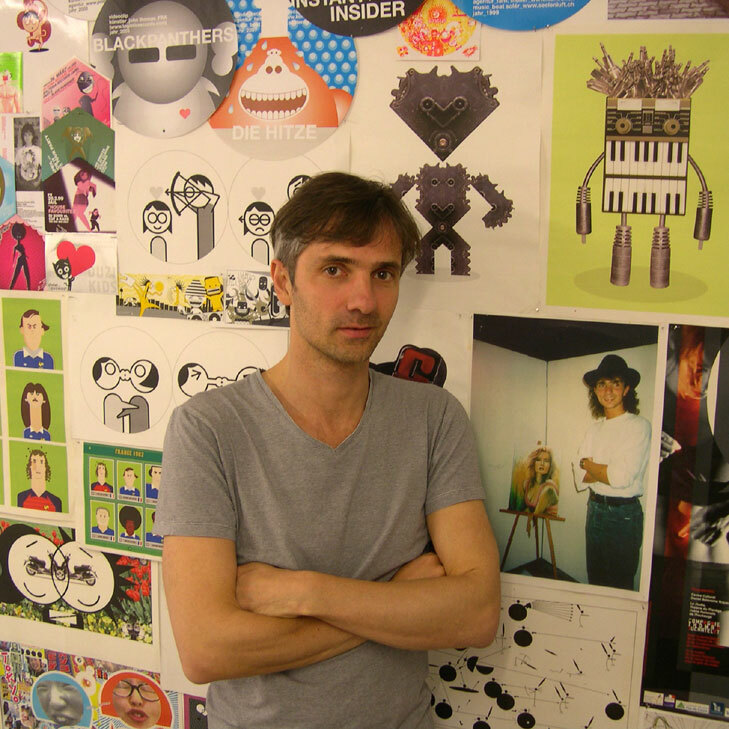 See them on the top on > Artists > Mark Thompson. Schacher – Raum für Kunst now has its own Facebook site (the site is – like this homepage – a work in progress). Visit me on Facebook! This provisional version of the gallery’s homepage can be found online. 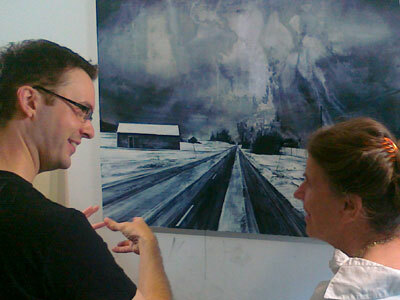 The preparations for the first exhibition opening on 28 January 2011 are underway. Udo Schöbel and his ‘minibeatclub’ are coming and Prof. Dr. Tilman Osterwold be acting as opening speaker. At the 19.11.10 opening of his final exhibition “Das lachende Auge” Bethold Naumann introduced me as his successor, a fact kept unknown until now.